Is food included on a cruise, or do I have to pay extra? Your cruise fare always includes food for breakfast, lunch and dinner on a cruise ship. However, not all venues that offer food will be free. The main dining room and cruise ship buffet will always be included in your cruise fare, though a few specialty items might cost extra. Most upscale or sit-down specialty restaurants incur an extra fee, either a flat cover charge or a la carte pricing per item. Some of the more casual additional spots are free, while some charge a nominal fee. Prices are typically marked at each venue. What kind of dining options are on a cruise ship? Cruise ships offer a variety of onboard restaurants and dining options. Typically, the bigger ships will have more options, but even the smallest ships tend to have more than one restaurant. In general, cruise ships will have a main dining room, a sit-down venue where you can order from a menu of American and Continental favorites (often with some international choices). These are very large, banquet-style restaurants, with a dress code enforced at dinner, and where you will likely have to share a table with other passengers. Most ships will also have a buffet restaurant near the pool, where dress is more casual and passengers can help themselves to pre-prepared food. Many ships also have specialty restaurants, smaller venues with more tables for two. These cruise restaurants will be themed: steakhouse, French bistro, Italian trattoria or Japanese sushi restaurant. More casual alternative dining areas might be outdoor grills and BBQ spots, pizzerias, hot dog stands or bakeries. 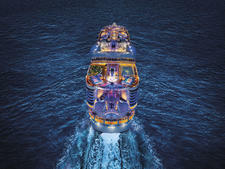 Some ships have exclusive dining venues, only accessible to passengers in suites or spa cabins. Yes, food can be delivered to your cabin 24/7 on most major cruise lines' ships. Typically, the room service menu features a Continental breakfast (some lines offer a few hot items, sometimes for an extra fee), plus an all-day menu of sandwiches, salads, pizza, perhaps a few hot items or appetizers, and dessert. Room service is generally free of charge; some lines, such as Norwegian and Royal Caribbean, charge a per-order fee for middle-of-the-night orders. Other lines, like Princess Cruises, charge for pizza delivery. What if I want a mid-morning or afternoon snack? In addition to room service, which can be ordered round the clock, many cruise ships make food available 24/7 (or at least during normal waking hours). All-night venues might include a small section of the buffet, a pizzeria or a shipboard diner. During the day, the buffet and some of the casual dining spots might serve food throughout the afternoon, and onboard coffee shops tend to offer small snacks and baked goods. Can I bring food back to my cabin? No one will stop you if you take food from the buffet or other casual venue and bring it back to your room. If for some reason you need to leave the main dining room or sit-down specialty venue early, you can always ask your waiter to plate up the remainder of your meal to take with you. Can I bring my own food onboard? Yes, you can bring your own food onboard -- including snack food you like to have on hand and items you pick up in port. You can't bring raw meat onboard, but pretty much anything else is fair game. However, there's so much food onboard that, unless you're very picky or have a dietary restriction, there's not much need to bring your own food. Can I take food off the ship? You are technically not allowed to take food off a cruise ship, especially fruits and vegetables. However, if you bring your own pre-packaged snacks, you can take them off the ship for port-day snacking. Will my children find food they like onboard? The main dining room and other sit-down cruise restaurants will have a children's menu (often with standards like pasta and chicken fingers), though your child is welcome to order off the main menu. You can always request a smaller portion of a regular dish for a young traveler. The buffet has such a variety of food that you are bound to find something a child can eat. There's often pizza, burgers, pasta and sandwich fixings, plus plenty of cookies and ice cream. Baby food, however, is not as standard. Some cruise ships will puree food for your new eater, but you might need to request it in advance. Others will not. Check with your cruise line before you sail, as you might need to bring your own jarred baby food. You will also need to bring your own formula. Whole milk is often available, but for convenience, you might consider taking cartons from breakfast and storing them in your cabin's minifridge for later in the day. Can a cruise ship accommodate my dietary restriction? Yes. Cruise ship restaurants pretty much always have vegetarian options; low-salt, low-carb, gluten-free and vegan food is either available and noted or can be prepared with advance notice. Kosher food must be pre-ordered before your cruise and is typically pre-made off the ship and frozen for use during the cruise. In general, if you have a strict diet or a severe allergy, it's best to alert your cruise line in advance, either through your travel agent or a cruise line's special needs department. You can then meet with the head chef on the first day of your cruise to make sure you get the meals you need. For more, see our tips for cruising with a dietary restriction. How can I learn more cruise ship food? The What to Expect on a Cruise series, written by Cruise Critic's editorial staff, is a resource guide, where we answer the most common questions about cruise ship life -- including cruise food, cabins, drinks and onboard fun -- as well as money matters before and during your cruise and visiting ports of call on your cruise. Fee vs. Free: What's Included in Your Cruise Fare? Cruise Critic ranks the world’s largest cruise ships by gross tonnage along with additional information including passenger count. Cruise ship sun decks offer all the convenience of loungers, hot tubs and beverage service -- and all the headaches of screaming children, rock concerts on poolside screens and live bands playing "Hot Hot Hot" for the 20th time. Adults-only sun decks offer all the former in a much more serene environment. We have nothing against kids, but even on the most family-friendly cruise ships, an area explicitly excluding children gives parents a valuable hour or two of "me time," while maintaining the sanity of fellow cruisers who came on vacation for peace, quiet and minimal crying. Adults-only sun decks come in a variety of shapes and sizes. 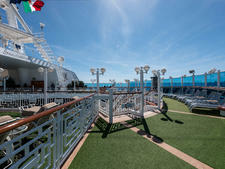 Many have amenities not available in the main deck areas and nicer loungers or sun beds; some also require an entry fee. We have not included adults-only solariums that are strictly covered pools. If the only "whining" you want comes with dining, then consider the following six sun decks that maintain a strict adults-only ambiance. There once was a not-so-savvy seafarer who didn't feel right unless she took two steamer trunks crammed with outfits on every cruise. This, she learned, was not a good idea. Besides incurring the wrath of her male traveling companion, who pointed out that he would have to wrestle with excess baggage through airport terminals and beyond, she quickly tired of cramming her belongings into tiny closets. The now savvy seafarer follows this packing rule: Thou shalt put into one's suitcase only that which will fit neatly in the allocated cabin storage space. Following that advice is getting easier because, for the most part, cruising has become a more casual vacation with relaxed dress codes. 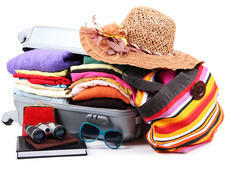 Plus, with airlines charging to check bags, it's just plain economical to pack light. To do so, you need to have a good sense of what you’re going to wear on a cruise so you don't pack your entire closet. If you're wondering what to bring on your next cruise, here are our guidelines for what you'll need to pack. It's one of the most common cruising questions: When is the best time to cruise Alaska, Australia, the Caribbean, Canada/New England, Hawaii, Europe or the South Pacific? The answer depends on many variables. For example, fall foliage enthusiasts will find September and October the best time to cruise Canada/New England, whereas families prefer to sail in summer when temperatures are warmer for swimming. The best time to cruise to Alaska will vary depending on your preferences for viewing wildlife, fishing, bargain-shopping, sunshine, warm weather and catching the northern lights. For most cruise regions, there are periods of peak demand (high season), moderate demand (shoulder season) and low demand (low season), which is usually the cheapest time to cruise. High season is typically a mix of when the weather is best and popular travel periods (such as summer and school holidays). However, the best time to cruise weather-wise is usually not the cheapest time to cruise. The cheapest time to cruise is when most travelers don't want to go because of chillier temperatures or inopportune timing (too close to holidays, the start of school, etc.). But the lure of cheap fares and uncrowded ports might make you change your mind about what you consider the best time to cruise. As you plan your next cruise, you'll want to take into consideration the best and cheapest times to cruise and see what jibes with your vacation schedule. Here's a when-to-cruise guide for popular destinations. 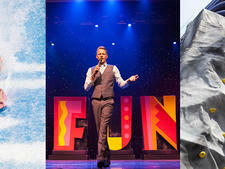 We recommend the best cruise lines for first timers in a variety of categories, as well as runners-up. 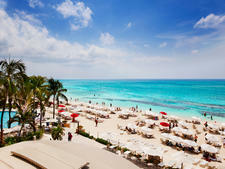 So dry your cruise planning tears, and get ready to find your perfect cruise line.